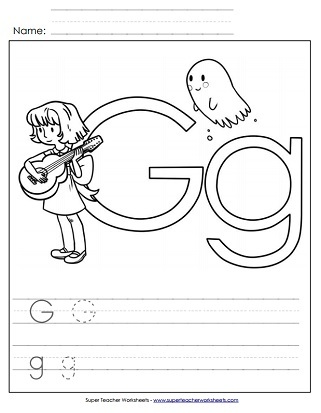 Practice writing letter G g on the primary-ruled lines then color in the picture of the ghost and the girl with a guitar. 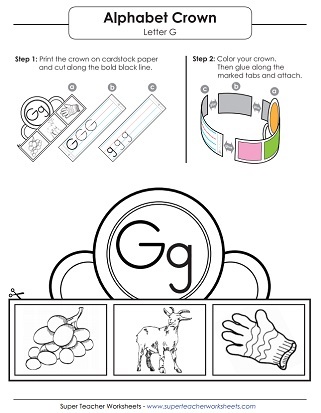 This file has a G headband for your students to make. Graphics include grapes, a goat, and a glove. Trace the dotted lines to practice writing lower-case g on this worksheet. Another great printable worksheet for students to learn writing the lower-case g.
This worksheet focuses on capital letter G and allows for practice handwriting on the dotted lines. This writing exercise has gray lines to be traced to learn capital letter G.
Find the letter G g, practice writing G g, then write words with G g.
Learn to recognize the letter G by using an ink dauber to dot the circles.